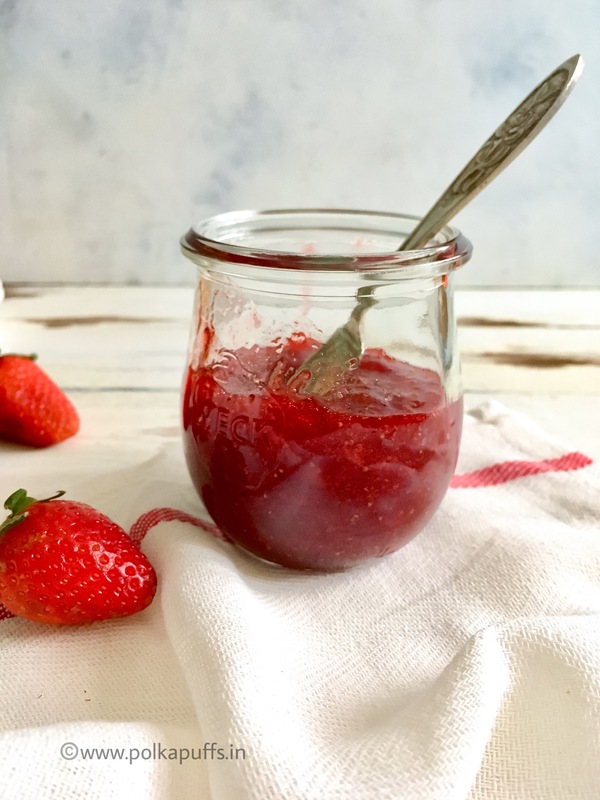 3 Ingredient Strawberry Jam | Strawberry Preserve | No Pectin Strawberry Jam | Homemade Strawberry Jam!! What’s not to love? It’s free of any preservatives, no pectin or added colors….it’s a win-win recipe all the way through. 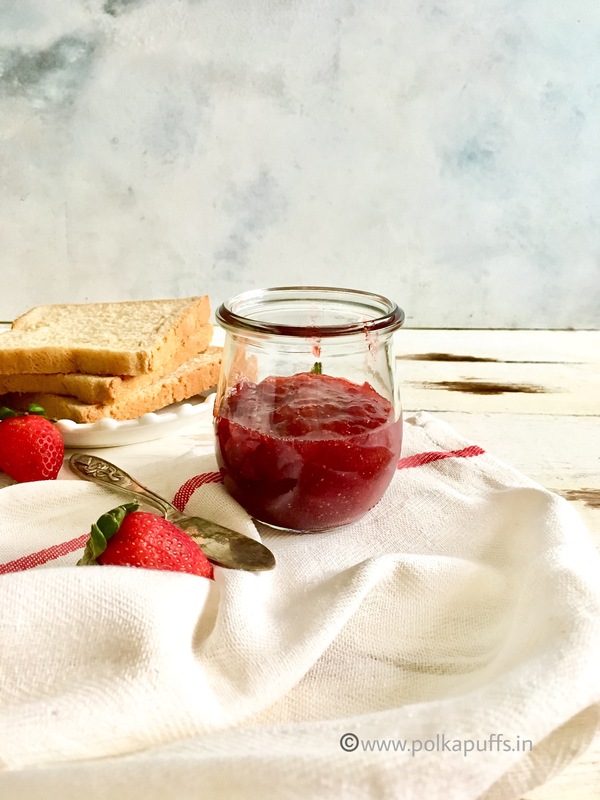 Look at the glossy texture of this 3 Ingredient Strawberry Jam | Strawberry Preserve | No Pectin Strawberry Jam | Homemade Strawberry Jam 😍 So very luscious! It’s better than the store bought jams. The flavors are so fresh and fruity with hint of tang. I like this slightly chunky so did not mash the fruits too much, it’s completely up to you. I highly recommend that you make this once at least while we are still getting loads of fresh strawberries all around us. I had made a batch a few years ago and had long forgotten all about it until I found a really nice recipe just last week! I was excited and wanted to give it go…and it has turned out just perfect! 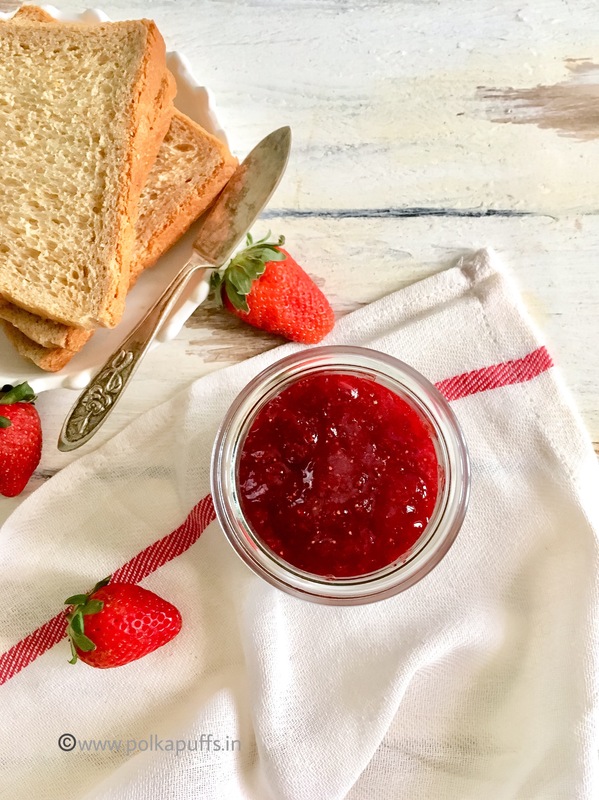 The best part is that my hubby…who loves his Strawberry Jam/ Preserve, approved this with a big smile! Happy Dance!!! 💃🏻💃🏻🤗 It tasted fabulous with some bread…or go crazy making so many more desserts using this! Let’s get going with the recipe. Wash the strawberries, pat them dry. Then hull them using a paring knife (a regular knife will also do). Chop them roughly and keep them in a large bowl. Add sugar to this and mix well. Cover and set it aside for 4-5 hours. Remember to stir it once every 30 minutes or so. This will macerate the strawberries well (help in releasing the juices). Heat a heavy bottomed pan, add the strawberries with all their juices to the pan, stir continuously until they come a rolling boil, this will take about 6-7 minutes. Using a potato masher, mash the strawberries well and continue to stir. Cook for another 10 minutes. Add the lemon juice at this stage (lemon juice is added to give a nice gloss to the jam). Let it cook & allow the juices to reduce for a few minutes, but ensure you stir it constantly. Once the jam looks thick and gooey, drop some on the chilled plate and wait for 30 seconds to let it set. Then draw a line in between, if the lines do not spread into each other, it means that the jam is ready & you can turn off the gas. If not, then cook it for another 5-7 minutes and repeat this step with another chilled plate. Cool the cooked jam thoroughly and store it a clean & dry glass bottle/ jar. Always use a dry spoon to remove the jam. Store this in the refrigerator and it should last for over 3 months. 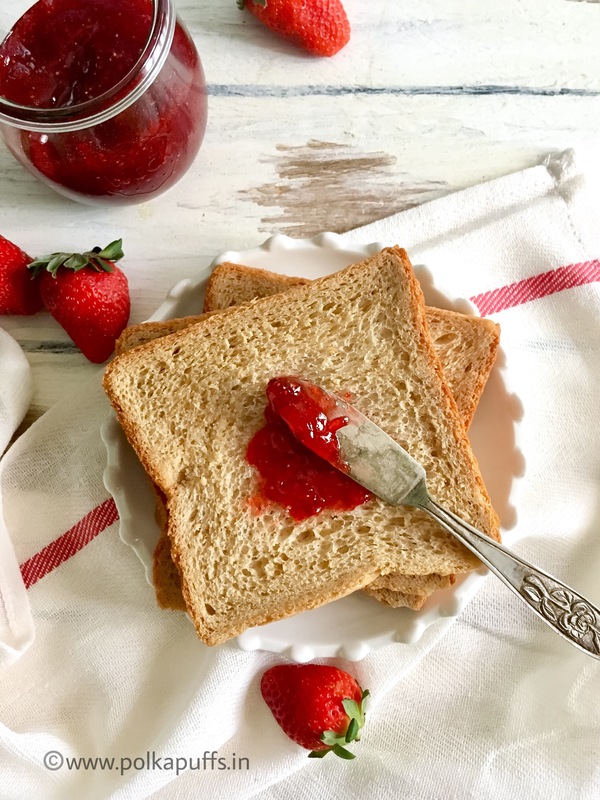 3 Ingredient Strawberry Jam is so easy to make and comes together in a flash, it needs no pectin. Enjoy this with some bread or top your favorite muffin with some jam! After 4-5 hours, that's how they should look. Once the jam looks thick and gooey, drop some on the chilled plate and wait for 30 seconds to let it set. Then draw a line in between, if the lines do not spread into each other, it means that the jam is ready & you can turn off the gas. Dry the strawberries completely before slicing them. Let the strawberries macerate well to get the best taste. Cool the jam completely before storing them in jars.